According to World Bank estimates, earth’s population will approach the 10 billion mark as early as 2050. As of yet, the massive growth in world population has led to an unprecedented increase in food demand. Furthermore, traditional forms of agriculture put excessive pressure on lands and water resources. The result is increased scarcity of drinking water and even cultivable land. 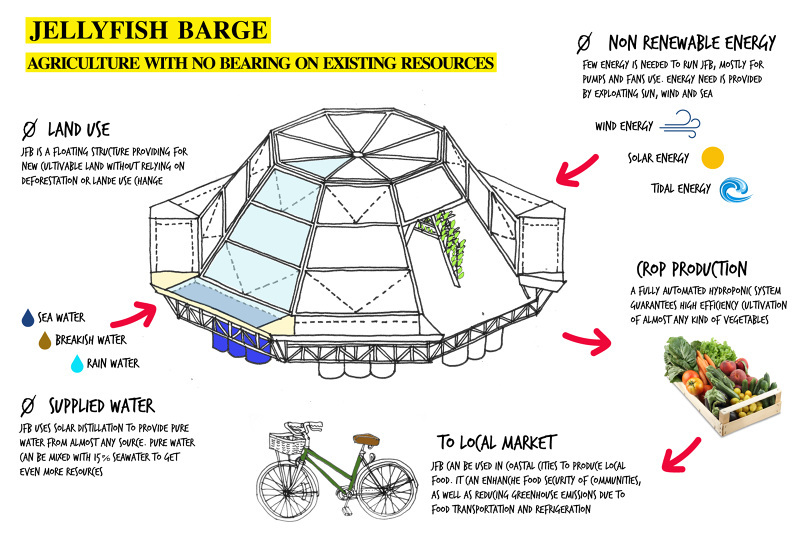 Consequently, in an attempt to promote sustainable agriculture, Italian company Pnat has developed an incredibly innovative floating greenhouse. 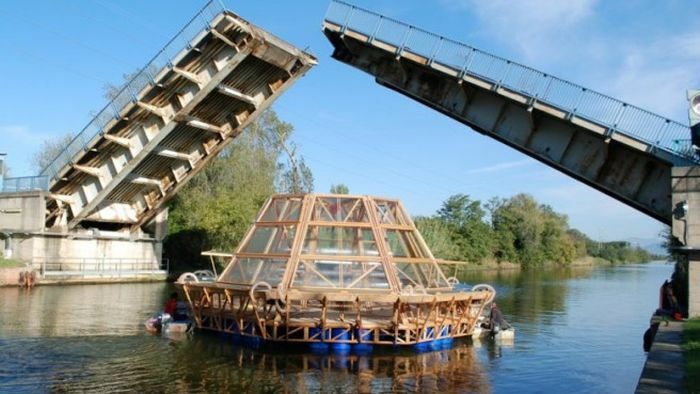 Known as the ‘Jellyfish Barge’, the structure is capable of producing sufficient food to feed two, separate families. Resembling a jellyfish in appearance, the structure features a 70-square-meter (753 sq. ft.) octagonal base made of wood. As many as 96 recycled plastic drums are affixed to the underside of the decking , by means of narrow wood beams. This is done to ensure that the entire setup remains afloat. 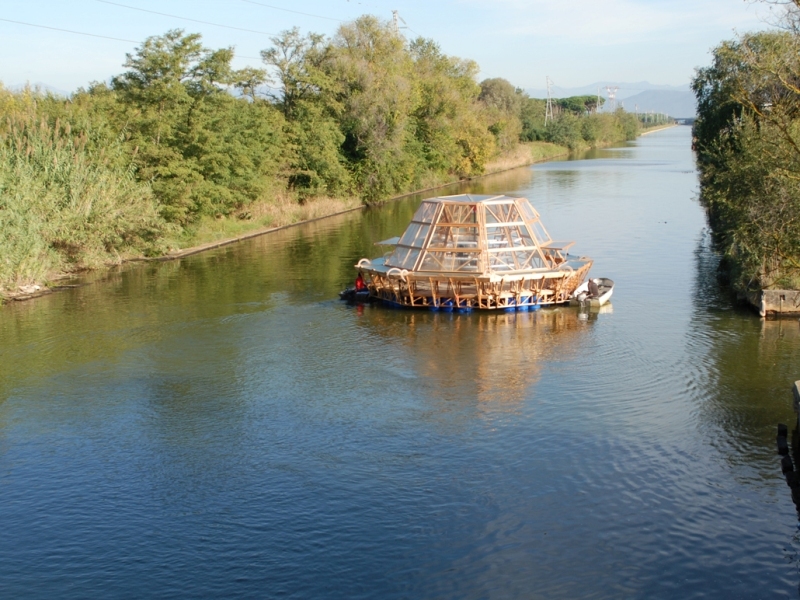 As an added advantage, it’s extremely low-cost and modular design allows multiple Jellyfish Barge units to be attached to one another. 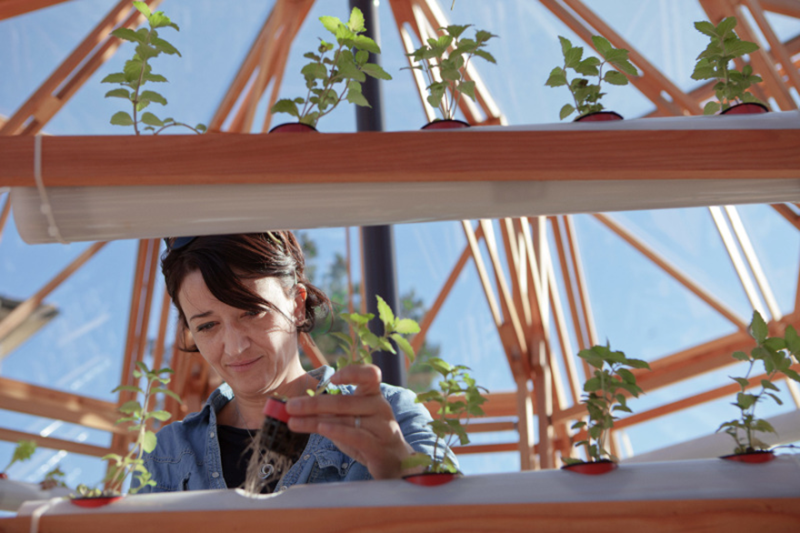 The greenhouse is conceived as an alternative to conventional means of food production, especially in areas with less arable land. 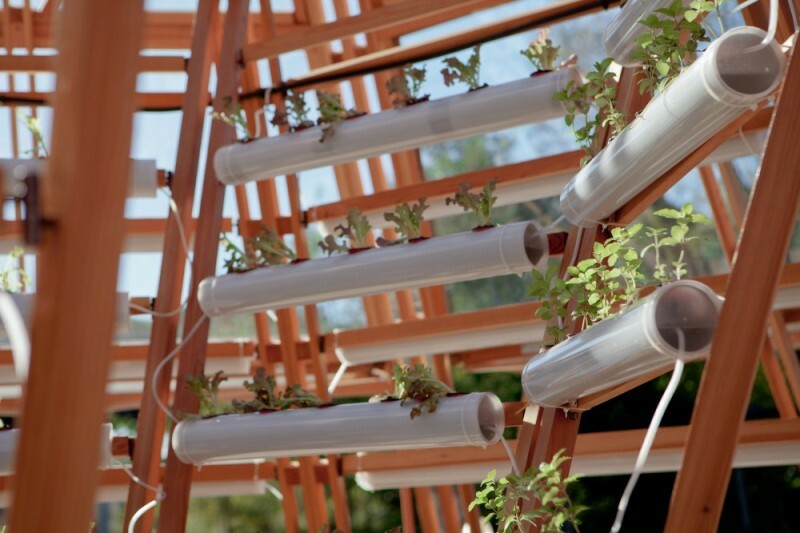 In fact, it makes use of the water it floats on to irrigate the crops. 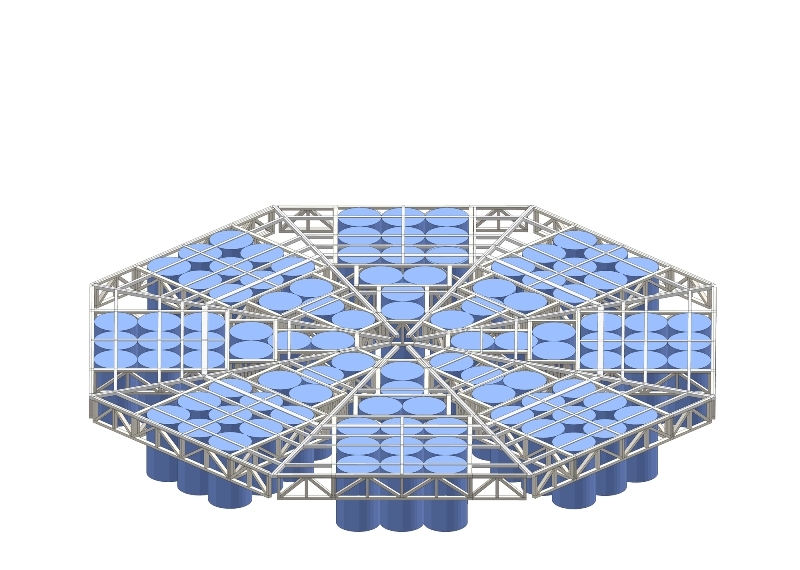 Solar distillation is a natural phenomenon: in the seas, the sun’s energy evaporates water, which then falls as rain water…In Jellyfish Barge the solar desalination system replicates this phenomenon in small-scale, sucking moist air and forcing it to condense into drums in contact with the cold surface of the sea. The low energy required to power fans and pumps is provided by systems exploiting renewable energy integrated in the structure. 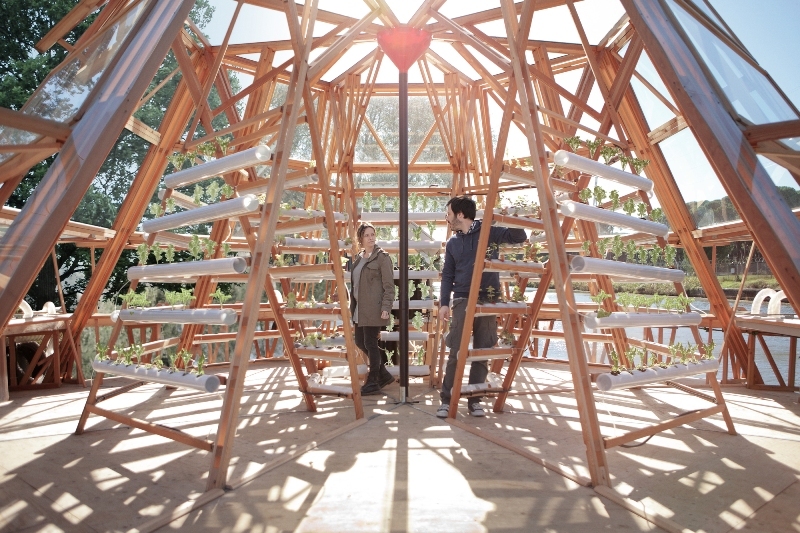 The interior of the greenhouse features extensive scaffolding, that in turn houses a hydroponic garden. 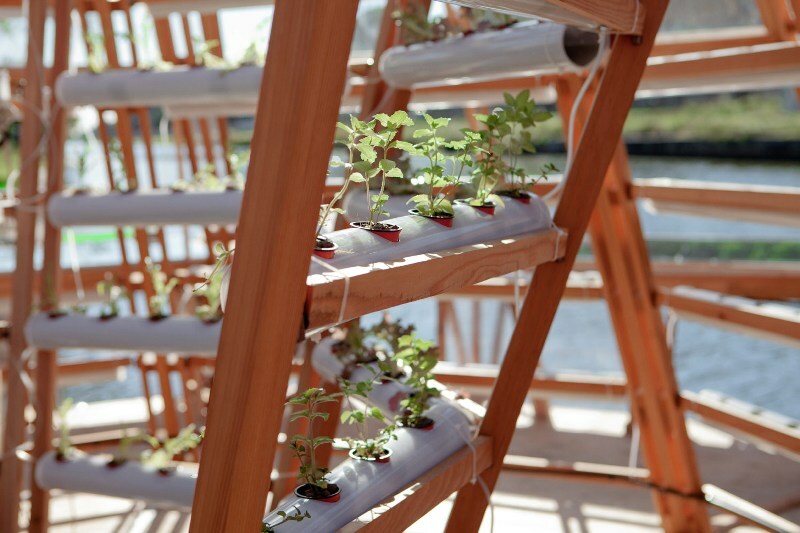 Hydroponics is a process by which plants can be grown using only water and nutrients, and without soil. 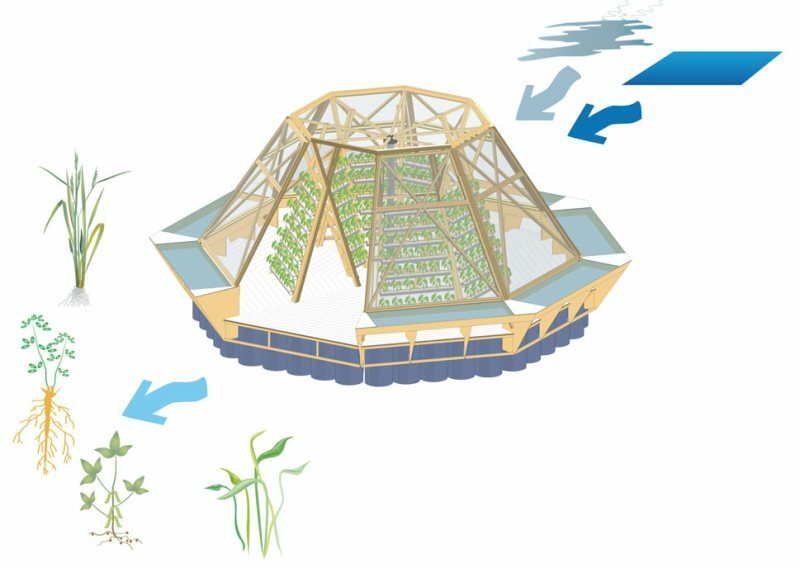 In this case, the eco-friendly and energy-efficient design of the greenhouse ensure 70-percent less water wastage than conventional hydroponic systems. 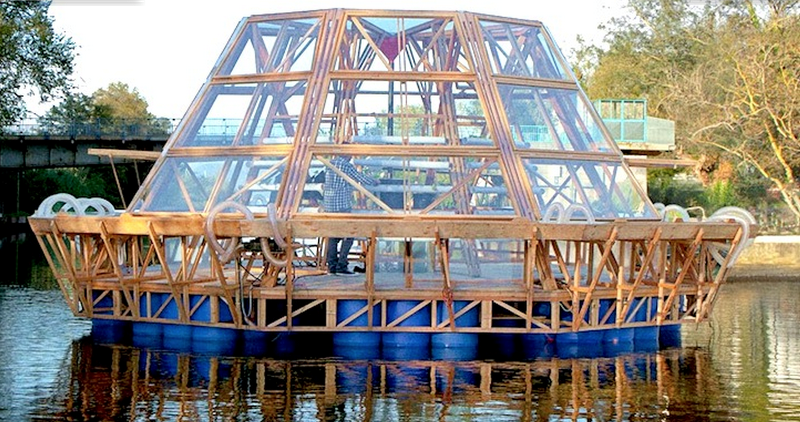 Instead of dipping into its freshwater reserve, the Jellyfish Barge uses around 15-percent of seawater to develop the nutrients solutions; a step that further improves its efficiency. What is more, the system comes equipped with remote monitoring. While the project is still under development, the company is currently working towards building a more cost-effective and environment-friendly design.